About — Taylor Street Tattoo Co.
Taylor Street Tattoo is a classic tattoo studio specializing in traditional and custom designs. We strive to provide our clients with a clean, solid tattoo, and service that's professional and reliable. It was a rough road in the beginning. After purchasing the building in 2002, Underwood entered a tumultuous two-year legal and court battle. He fought local businesses, schools, and residential associations who claimed having a tattoo shop in Little Italy would bring a “bad element” to the neighborhood and subsequently drive property values down. Underwood won his court case and opened the doors to Taylor Street Tattoo. He has owned the business ever since. Since opening, the shop and owner Underwood have proved everyone that opposed him wrong. Property values have increased, while the shop has become a vibrant and integral mainstay in Little Italy, continuously brings tourism and community ethics to the historic Chicagoland neighborhood. 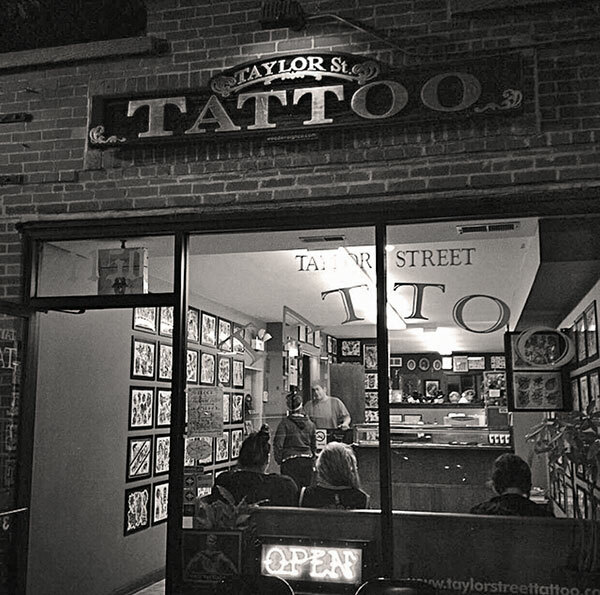 Taylor Street Tattoo has been the focus of many films and articles over the years because its direct lineage to Norman Keith Collins (the original Sailor Jerry). Collins mentored Mike Malone and Don Ed Hardy in Hawaii before Malone relocated to Chicago. Malone took Underwood under his wing, which eventually culminated into opening Taylor Street Tattoo. The “no nonsense” and “our-work-speaks-for-itself” attitude that Jerry instilled in Malone was passed to Underwood and is still very much present at the shop today. Taylor St. Tattoo prides itself on keeping the classic tattoo motifs alive today; bright, bold, affordable modern electric tattooing!